The LunarPages web hosting company is successfully managed by Ron Riddle since its inception in the year 2000. The company boasts of over 100,000 satisfied customers and has two data centres; one in Los Angeles, California and the other at Las Vegas, Nevada. The company is instrumental in providing reliable hosting solutions at affordable price structures and offers a robust dual gig-E network. 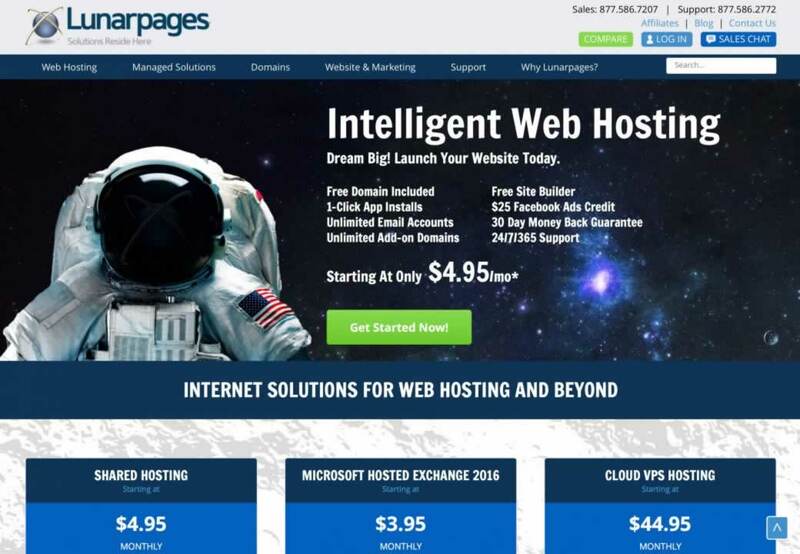 In fact, LunarPages was awarded Best Web Host 2006 for their unmatched reliability, quality, and customer support. The company has a number of web hosting options to choose from to cater to a wide customer base in terms of requirements and pricing structure. Their most basic web hosting plan is priced at $6.95 per month and is an ideal plan option for new webmasters, bloggers & small businesses requiring e-commerce. This plan comes with 24/7 quality customer support and its key features include $700 worth CoffeeCup design software free of cost, 350 GB storage, 3500 GB bandwidth per month, an online control panel, unlimited MySQL and postgre SQL databases, up to 10 add-on domains, unlimited FTP accounts, Ruby on Rails, PHP, PERL, PYTHON and much more. The second level Business hosting plan is priced at $21.95 per month and is an ideal plan option for businesses. This plan comes with 24/7 quality customer support and its key features include $700 worth CoffeeCup design software free of cost, unlimited storage, 3500 GB bandwidth per month, an online control panel, unlimited MySQL and postgre SQL databases, up to 10 add-on domains, unlimited FTP accounts, Ruby on Rails, PHP, PERL, PYTHON, customizable error pages and much more. The Windows hosting plan is an ideal option for sites running ASP.net requiring the Windows platform. This plan is priced at $8.95 per month and requires no setup fee. This plan comes with 24/7 quality customer support and its key features include $700 worth CoffeeCup design software free of cost, up to 5000 MB of storage, 400 GB bandwidth per month, an online control panel, unlimited MySQL and postgre SQL databases, 1 add-on domain, CGI, PHP, PERL, customizable error pages and much more. The VPS (Virtual Private Server) hosting is a good choice for websites with high traffic & resource requirements. This plan again comes with priority 24-hour support. The plan is priced at $39.95 per month and requires no setup fee. Its key features include a free domain name for life, 20000 MB storage, 1000 GB bandwidth per month, a Virtuozzo power panel, Plesk 8.1, flexibility to host unlimited sites and much more. All plans include a 30-day money back guarantee. The company is successful in putting their customers’ business online in a secure and efficient environment, with reliable dual-core processors for an effective backup. Customers can contact by phone or fax as well as through a support ticket. Their international number is 714-521-8150 (outside the US and Canada) and at 714-521-8150 (for USA and Canada). UK customers can call 0800-072-9150. Altogether, LunarPages offers reliable and superior services and a perfect platform to set up your website.